US Vice President Joe Biden has chosen this week to come to what is still Europe’s great unfinished business – the West Balkans. Can Biden knock any sense into his Serb hosts? Unlikely, says Denis MacShane. Denis MacShane is the UK’s former Minister for Europe, and travels regularly to the Balkans. The last official foreign visits of the leaders of an outgoing administration are usually reserved for seeing old friends, and maybe a little glass in the sunshine, as a reward for all the hard grind of trying to coax allies and less-than-friends into seeing things from your government’s point of view. In the Balkans, the Ottoman, Russian, Austrian-Hungarian and German imperial powers scratched at each other for centuries, leaving behind after 1945 an artificial construct – Yugoslavia – which collapsed the moment communism ended, and a wily Croat wheeler-dealer, Tito, was replaced by the ultra-nationalist Serb, Milošević who in less than a decade saw six nations remove themselves from rule by Belgrade. Two – Slovenia and Croatia – have made it into the EU. The others, along with Albania, are still waiting. The midwife of this springtime of Balkan nations was the United States, and especially Joe Biden, who condemned the Milošević doctrine of Serb supremacism and in the US Senate and then, as Chair of the Senate Foreign Relations Committee, insisted that Serb ultra-nationalism should not prevail. The brutal medieval-style siege of Sarajevo followed by the Serb massacre at Srebrenica in 1995 and then the ethnic cleansing of 850,000 Kosovans four years later who fled for the hills or over borders rather than risk Serb genocidalists, changed public opinion. But Biden was already the global spokesperson for supporting freedom from Serb rule in the West Balkans, even if the political-judicial structures set up in the new nations were pitifully ill-equipped for the task. Biden got first-hand reports from his son, Beau, like his father a Delaware lawyer who served in the army and spent a year in Kosovo in 2001 training lawyers and judges. Biden junior came home to rise in state politics with every chance of making a national political career when he suddenly died, aged 46, from brain cancer in 2015. His mother had been killed in a car accident in 1972 when Joe Biden was elected at age 30 to be the youngest ever senator in America. Many politicians have family tragedies to live with, but for Vice President Biden to lose wife and then son seems an unfair curse from the Gods. In Kosovo, Biden will unveil a stretch of a highway named after his son and meet Kosovo’s leader, President Hashim Thaçi, a convinced Americanophile. Thaçi has just returned from Rio, where he saw the Kosovan Majilinda Kolmendi win a gold medal for judo. It should be a good moment for Kosovo, but just as the tiny nation was celebrating its Olympic glory, the Prime Minister of Serbia, Aleksander Vučić, stood up in the Belgrade Parliament and referred to Kosovo as a ‘southern Serbian province.’ Earlier in the year, the President of Serbia, Tomislav Nikolić, refused to join all other Balkans leaders at Thaçi’s inauguration as president by stating that Kosovo ‘did not exist as an independent state’. Biden travels to Serbia after Kosovo and will encounter the surreal nature of Balkan politics in which countries pretend that their neighbours do not exist. Maybe a Samuel Beckett or a Franz Kafka could do justice to the self-belief in Belgrade that Kosovo doesn’t exist. Talk to an intelligent Serb and shoulders are shrugged, as they say, of course, that Kosovo has gone and won’t come back. But there is a mental blockage in the political class and as a result, Serbia cuts off its nose to spoil its face as the European Union is not going to consider Serbia joining the EU like Slovenia or Croatia until it first recognises Kosovo and normalises relations with its new neighbour. 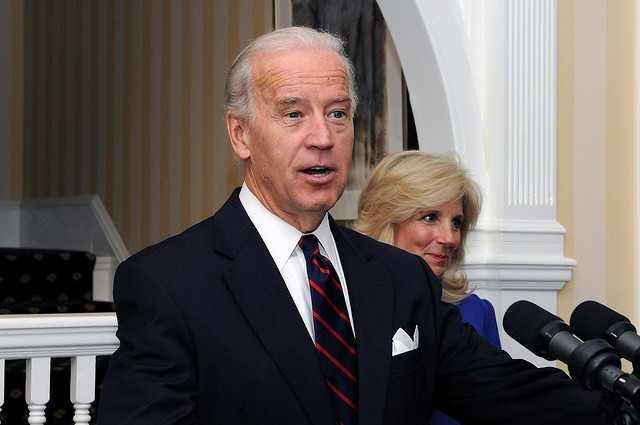 Can Biden knock any sense into his Serbs hosts? Unlikely. Bismarck famously said that the Balkans were not worth the bones of a single Pomeranian grenadier. Today, as the West Balkan route from Greece to northern Europe of so many refugees and economic migrants, as well as Islamist ideologues, is well travelled, one would think Europe might get its Balkans act together and lean on Belgrade to stop playing pretend games and accept that Kosovo is no more going to return to rule by Serbs than Ireland was ready to return to rule by the English after 1921. Putin is now Belgrade’s Number 1 friend, as the Kremlin loves to see the European Union unable to sort out such a relatively small issue. For Putin, stopping the US from declaring it has finally solved the Balkan conundrum is more important than helping to create stability in the broader Balkan region. So far, Serbia has not managed to win a single Rio medal and the sight of the Kosovan team boasting a gold is now doubt galling in Belgrade. Biden’s visit is a goodbye to a region he has devoted serious political time to. It is also a reminder that the West Balkans is Europe’s unfinished business, and that if the EU cannot sort out one of its own backyards, how can it claim to be a serious geopolitical player? And when Biden retires, are there any US politicians around ready to invest time and commitment in helping the West Balkans?